Coze started in 2012 when my passion for designing joined a need to create a friendlier planet for all people & all animals. I feel the greatest impact I could make as a designer is to create stylish and useful products that promote compassion while reducing textile waste that would end up in the landfill. 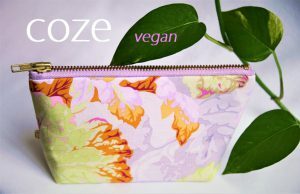 All products for the home and fashion are sustainably made from vegan-friendly & locally sourced materials and are designed and produced in my creative studio in Vancouver, BC.